Road Rally News from across North America – Coast to Coast! You are receiving this as an enthusiast of Road Rally in North America! No longer wishing to be a subscriber? Road Rally eNews was supportive of Cheryl Lynn and her Rally Clan as they took on the Sports Car Club of America's 2017 USRRC, September 14-17th. Enjoy Rick Beattie, Jon Krolewicz, and Philip Royle's take on the event over the 11 pages of coverage! We realize not all of you are on Facebook, visit RACER.com or even SCCA.com on a regular basis. Yet we wanted you to see the Road Show film with Drew Stearne and Evan Miller, of CBS Interactive. They ran the the USRRC and the film is their look on rallying, as newbies to the sport! 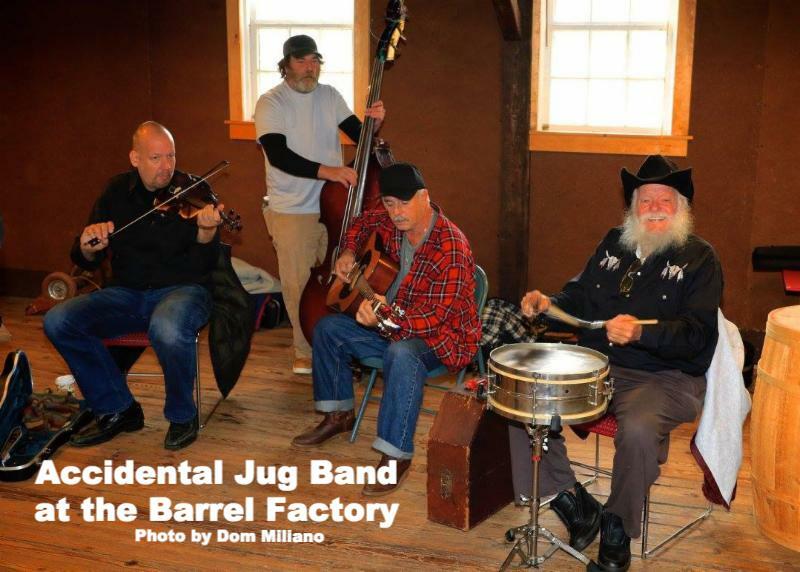 We played it for the Rally Clan in December, where many echoed the sentiments "Been there, done that!" and "Go straight. you're on course! Go straight!" 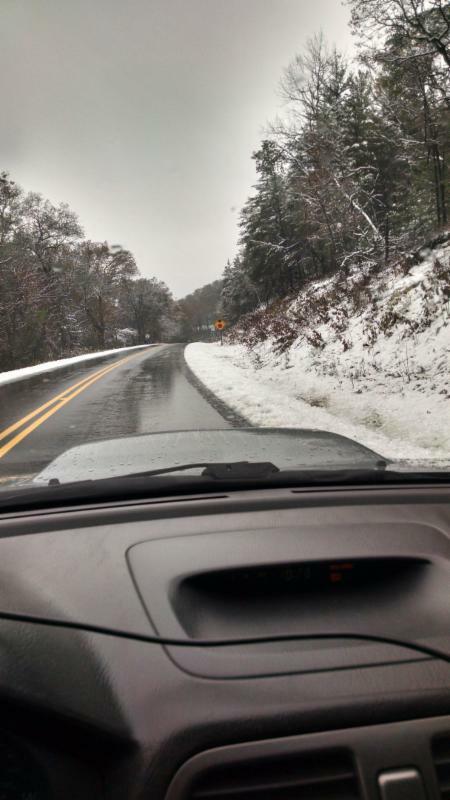 as they encounter Salmon Creek Road. Happy New Year Fellow Rallyists! Actor George Peppard, as the A-Team leader would say, "I love it when a plan comes together" and this summed my feelings on the United States Road Rally Challenge, which ran September 14-17th, 2017, from Anchorage to the Kenai Peninsula. The event increased my Rally Clan and reminded me why I founded the Arctic Alaska Region of the SCCA to build a home for my beloved motorsport when no others were interested in the sport. At one time there had been four clubs working to build Championship seasons. Twenty-seventeen presented some challenges on the volunteer front for me, yet the true friendships made through the associations shall carry forward. Those organizations who simply tolerate suggestions and advice vs appreciate the lessons to be learned from history seem destined to repeat steps taken by many mighty fine people over the years. I had the pleasure of trekking over to the SCCA Milwaukee Region Kettle Moraine Color Tour Road Rally in October with Alexis Parker , my 14-year-old Grand Niece, and I kept my promise to rally with her in Wisconsin. I need a road rally near Tampa, Florida, as there is a former rally checkpoint worker of mine, Clara Danielle , now age 13, who has been promised "we'll rally together"! Contrary to some elders in the sport, rallying is not dead! The loss of family and friends this year reminded me, painfully, that life is short. My family made it through that first Christmas after the passing of Ronald Gagas , my brother-in-law this past June. Kevin Bohall , whose participation in Road Rally started his motorsports activities in 1986 with Caron Steward , his wife, and were family. They traveled out to the first USRRC in 1985 with us, and he was committed to getting back in the game with this year's USRRC , yet lost his fight this summer. Many Hollywood icons and musicians from my youth passed, and I realize it is a fact of getting to my advanced age on this planet, yet for the record — I don't like it! When the calendar flipped over to 2018, it was confirmation that life goes on. Road Rally eNews will begin it's sixth year! A recent search for a piece, which ran three years ago, stunned me at all we had covered these last five years as I sifted through the archives. The various cover photos, submissions from Rallymasters for their events, tips on rallying, history pieces, contributions to There's an APP for That , My First Road Rally , Words from the Wheel , as well as providing SCCA Members with the SCCA Planning Calendar, Championship Standings and RoadRally Board Minutes all served to remind me how truly blessed Road Rally eNews has been by the Road Rally community across North America. I am pleased to announce that we will have Smuncher's Attic added to our monthly column contributions for 2018, authored by Bruce Gezon . James Crittenden , the newly appointed RoadRally Board Chair, will be contributing to our pages as well. Please consider sending in your event information to encourage participation and awareness of your rally program. Intro to Smuncher's Attic by Bruce Gezon , NNJR Pine Barrens Trek by Peter Schneider , Milwaukee Region's The Blacke by James Jurgenson , SCCA RRB Update by Chairman Crittenden , Words from the Wheel by Jamie Mullins , Year End Standings from Bruce Gezon , December RRB Minutes and 2018 Planning Calendar by Jeanne English , and the Rallyist Newsletter by Harry Handley , SCCA Rally Director in 1969. 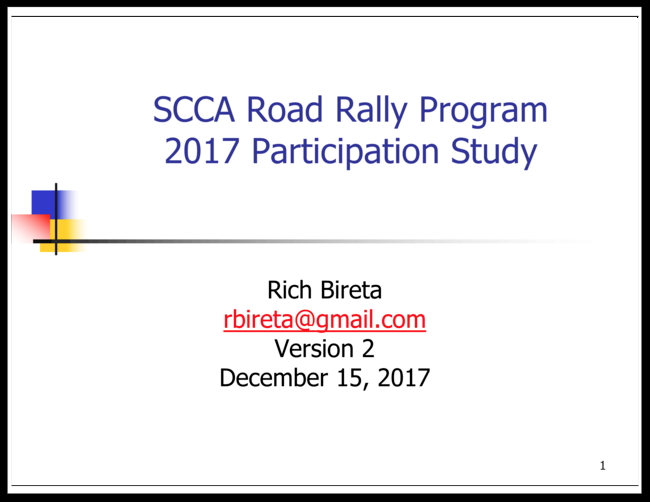 We also have the 2017 SCCA Participation Report from Rich Bireta and Gary Starr's Tips for Novice TSD Rallyists , which was just revised for 2018. Enjoy the wonderful contributions as we begin 2018. And we look forward to your contributions in the upcoming months! Please consider using the hashtags #comeroadrally and #wefoundtheroads in 2018 in your social media posts. The SCCA Road Rally Board (RRB) would like to congratulate the winners of the 2017 SCCA RoadRally National Championship. The complete results of the 2017 National Championship are posted on the SCCA website. Click here to view. The 2018 rally season is already taking shape as you can see from the Planning Calendar link elsewhere in this newsletter. For those folks who only ran events in their region last year, I encourage you to consider traveling a bit more and trying some events outside of your local area. You'll enjoy the additional variety of the events, as well as meeting new people and exploring new roads. 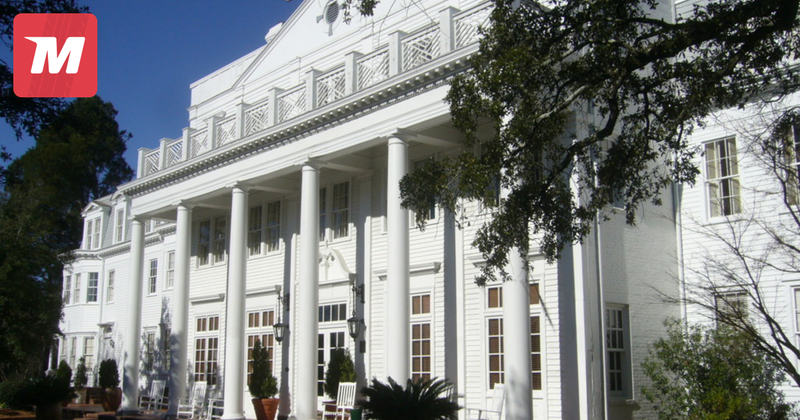 SCCA 2018 Convention Is Here! 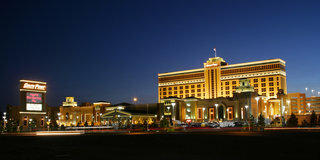 The South Point Casino and Convention Hall, Las Vegas, NV, will again be the site of the SCCA National Convention. January 18-20th will find the SCCA RoadRally Board presenting on starting a Regional RoadRally Program, offering RoadRally Safety Steward Trainig, and the RoadRally Town Hall. In addition to rally specific sessions, be sure to check the many tracks and consider attending Social Media, utilizing Motorsportreg.com for your events,or many sessions that crossover the spectrum of Solo, Race, and RallyCross!! Come Join Us! After weeks of planning, checking, adjusting, and preparation, the weekend of The Blacke Rallye was here. Watching the weather apps indicated only a 30% chance of snow and mid-teens for temperatures. Friday, December 8th, brought us maybe a ½ inch of snow. Just enough to make conditions very slippery on some of the less traveled roads. I had thought about running my snow tires but decided against it. Big mistake on my part. This event is run about 185 miles from my home, near Milwaukee, Wisconsin. That's where my Hakkapeliitta's were on a shelf in the garage. Fortunately, those competing were better prepared, and no one seemed to mind the conditions. I, running course opening, did have a few moments where I wished I had installed the snows. With that said, the Rallye was very successful. 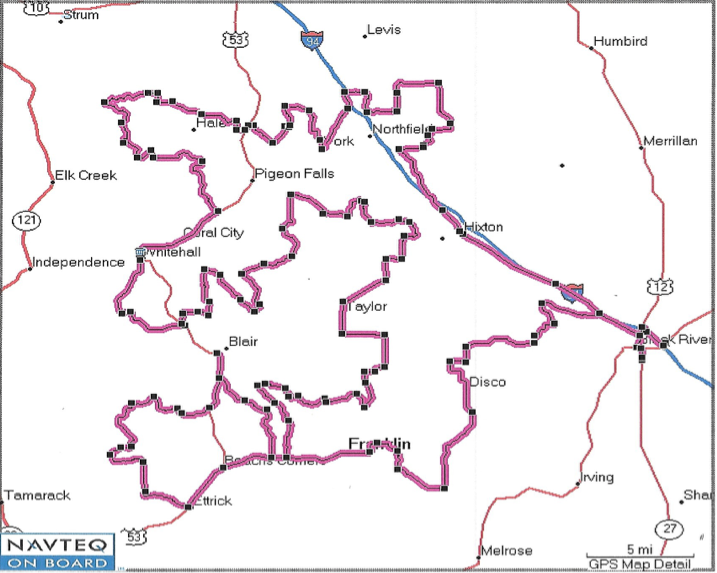 It ran 195 miles in Jackson and Trempealeau Counties. 18 controls warranted five crews and three breaks to move workers from one location to the next successfully. 19 cars competed, and all controls were in place when teams searching for that elusive zero arrived. 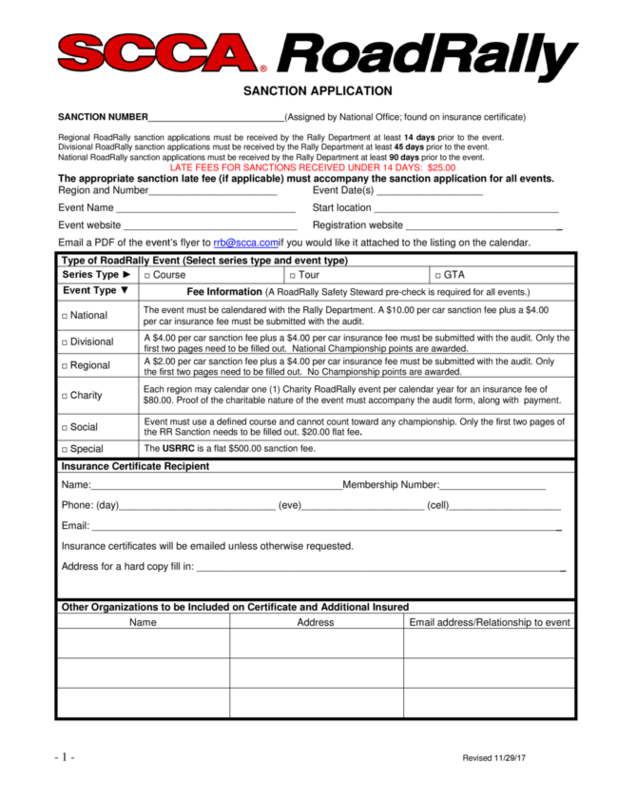 Only two teams failed to make the finish; one for a missed instruction that they were unable to recover from and one due to "The Blacke" of the night that caused them to bow out. 17 teams made the finish at Re-Pete's in Black River Falls, around 9:00 PM. The Saloon and Grill was anticipating our arrival, and they did an excellent job serving us and keeping drinks filled. Final scores were being tallied as participants arrived. We ask our Control Workers to fill out a log and then photograph it, with their phones, to text to Score Keeping. Back at Headquarters, these photos are entered into a spreadsheet that then could be displayed on a TV monitor at the Rallye's end. As long as we have a phone signal, it works quite well. Particip ants can see how well they and others have done leg by leg. They are then given an opportunity to challenge any scores that they believe to be suspect. After a short period , awards were distributed. Equipped : F our teams lead by Bruce Gezon and Bob Morseburg with 7 points. Limited : Ken Anderson and Dave Fuss with 57 points. Stock : Kurt and Paula Gross with 53 points competed against 9 teams. Happy New Year from the National Office! We here in the National Office are busy with the many tasks the new year brings! The SCCA National Convention is right around the corner, January 18 – January 21, 2018. I have reviewed the attendance roster and see a few familiar names, so please introduce yourself to me in the RoadRally sessions! There have been a few minor edits to the RoadRally Sanction Application. Please use the new form found at SCCA.com under Programs/RoadRally/Rules and Documents or in the About SCCA/Downloads section. Please note, the Sanction Application is now a fillable form. However, if you open it in the Microsoft Edge browser, it is not fillable. Save it to your computer and open it in Adobe, and voila, it is fillable. Adobe’s proprietary PDF format makes it so Edge can do nothing with fillable fields, just display them. The RoadRally Audit form has also been revised with the current return address at the bottom of the form. 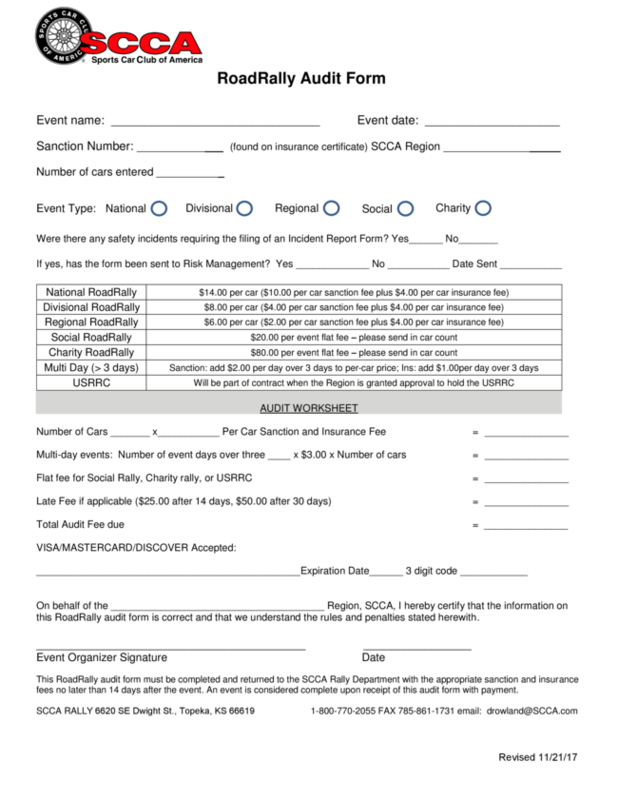 Please use the new form found in the same two areas at SCCA.com as the Sanction Application mentioned above. Finally, the 2018 RoadRally Rulebook will be available for purchase on Amazon later in January. 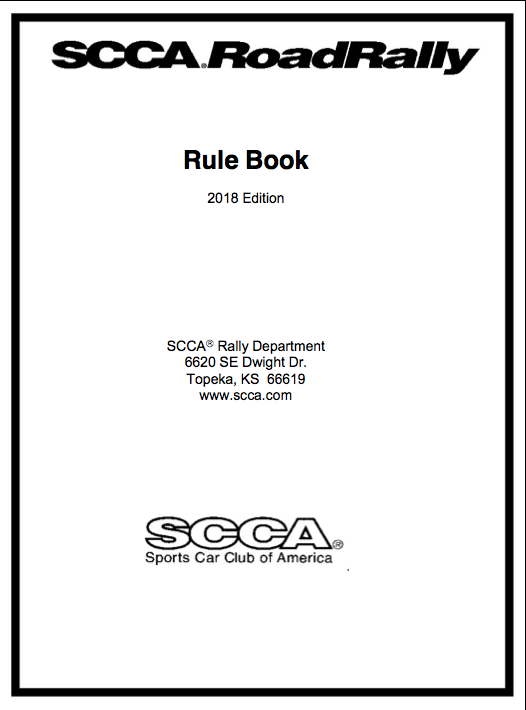 You can currently access the 2017 RoadRally Rules under Programs/RoadRally/Rules and Documents or in the About SCCA/Downloads section (or click Rulebook image); which will both be updated with the 2018 RoadRally Rulebook later in January as well. 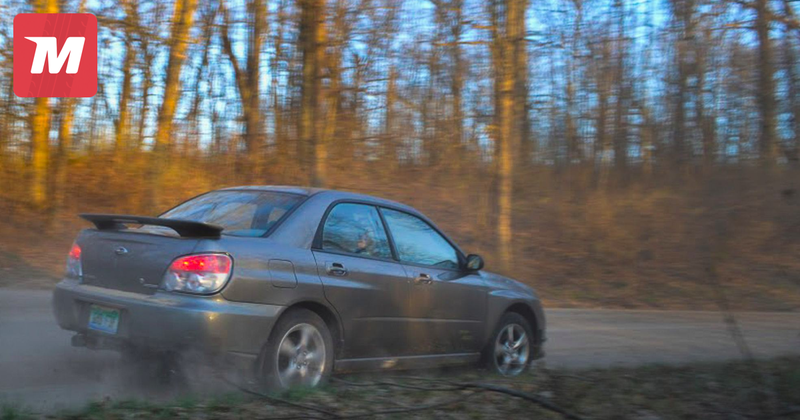 Should you have any general RoadRally questions, I encourage you to check out the newly revamped RoadRally section at SCCA.com. I am in the office M-F 8 a.m. – 5 p.m. CDT at 800-770-2055 x371, or you may contact me via e-mail at jmullin@scca.com. Please continue to direct any Event, Sanction and Insurance related items or inquiries to Deena Rowland via e-mail to drowland@scca.com or telephone 800-770-2055 x 331 M-F, yet do keep in mind she is there to serve you 7 a.m. – 3:30 p.m. CDT. It has been fairly common knowledge that I have been a hoarder of many things for many, many years and at my age, that means there truly are some ‘treasures’ that do have value for more eyes than just mine. Cheryl has accepted my offer of making some of the more interesting printed rally history a part of RReNews as a monthly column. The Smuncher Archives go back to the late-1950s and requests for specific info will be investigated and, should it be found, offered either privately on request or in the column. Like most keepers of ‘historic’ paperwork, not everything is filed where intended, so gaps do exist. A box full of paper does not lend itself to quick discovery versus the file folders in banker’s boxes. Then there is my withdrawal from SCCA RoadRally between 1977 and 1998 which eliminates most of the SCCA happenings of that era. I intend to offer interesting reading entertainment about our sport of rallying. Advice, suggestions, and criticism are welcomed. You may reach me via email. 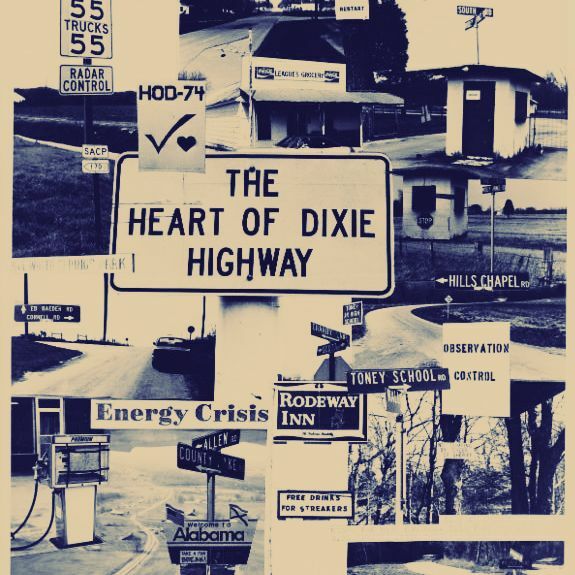 Heart Of Dixie is to be reincarnated in 2018 by Liz Witt and the Texas Region in a National GTA called Clear Blue Sky using the Heart of Dixie concept so loved back in the heyday of rallying. Thought this photo would bring back some memories for the other old-timers and pique the interest of those too young to really appreciate the deviousness of those rallies. 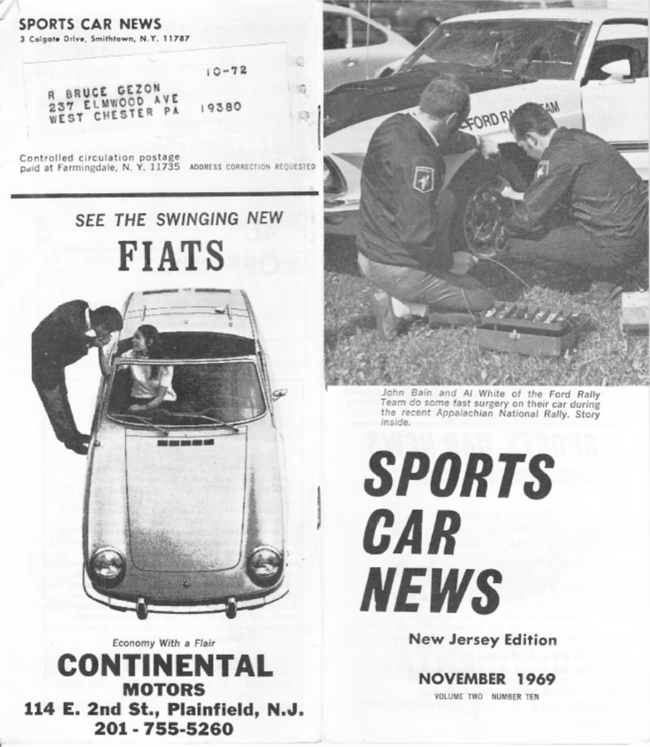 Here is an enjoyable piece from the November 1969 New Jersey Edition of Sports Car News. In this piece, Ed Bain does a great job of reporting on the SCCA Philadelphia Region Appalachian National Rally. You'll enjoy reading the course following explained and see that team protests are not anything new as well! Upcoming Road Rally Events for YOU! Post Your Upcoming Rally Dates and Invites HERE? You bet! We welcome you to Come Join Us! RReNews is not an SCCA Publication, yet produced in association with the Sports Car Club of America by road rally enthusiasts. Our goal is share news about our beloved sport of Road Rally across North America — be they sanctioned by the SCCA, PCA, BMW, or local marque clubs! Please send us news of your upcoming event dates and promotional materials to list, so as to make fellow rallyists aware of your events. And post event — send your write-ups and photos to share news of the adventure! You can send information to Cheryl Lynn by clicking here! We'll be unveiling more means as 2018 comes along. 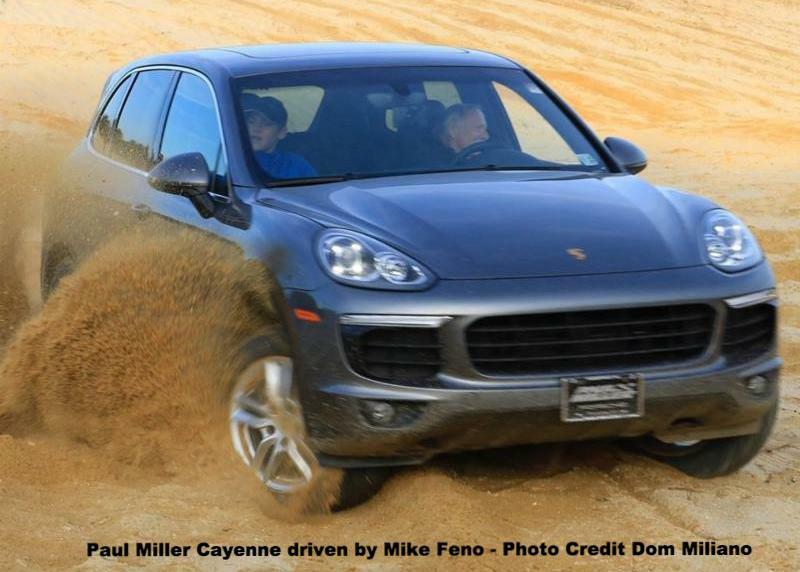 On November 12, Paul Miller Porsche sponsored the SCCA Northern New Jersey Region’s fourth Pine Barrens Off-Road Excursion . This year’s event motto as noted on the t-shi rts was WE’RE OFF THE MAP , and truly we were. The event is designed to provide members with Cayenne’s, Macan’s, SUV’s, Jeeps or Pickup Trucks a small sample of an ‘ off-road adventure ,' without putting the vehicles or occupants at risk. 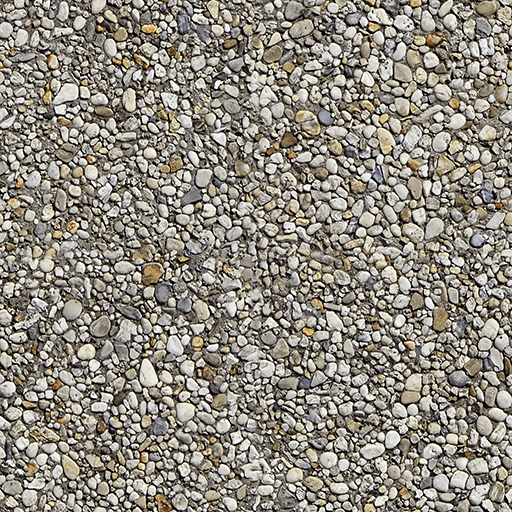 This year's event not only visited Brendan T. Byrne State Forest but included sand trails in Wharton State Forest and a short halfway break at the Wharton Visitor Center and Museum. Both of these New Jersey State Parks are within Th e Pinelands National Reserve in southern New Jersey ; this 1.1 million acres reserve is the largest open space on the eastern seaboard between Boston, MA and Richmond VA.
As in 2015 and 2016, Bob and I started working on the event in February, obtaining Special Use Permits for the trails in the State Forests, laying out the route and reserving space at the Lakehurst Community Center for registration/breakfast and the Pemberton Recreation Center for lunch. Last minute complications associated with Lakehurst Township, required us to move the start to the Pemberton Recreation Center, which greatly improved event logistics. Several trails that we were able to get permits for in February ended up to be unusable, due to a closure of a small narrow bridge we used in 2015 and restrictions imposed over the summer by the State Forest to limit exposure by motor vehicles to environmentally sensitive areas. Not everyone that uses the State Forests play by the rules. While Wharton State Forest originally had over 500 miles of ‘driveable' trails, overuse by ‘off-road' vehicles with oversized tires and ATV club creating unauthorized new paths in the forest have caused a lengthy permit process and heavy fines for those that venture off the approved route s. Sand roads that we used in 2015 were now off limits in 2017. We started the morning of the event with registration and a light breakfast at the Recreation Center in Country Lakes Estates, Brown Mills, just a short drive from Whitesbog Village, which was our first stop on the day’s event. Each of the 42 vehicles participating in the trek was provided with a bound set of route instructions with turn-by-turn instructions for the 90-mile course. The 111 route instructions provided mileage to the hundredth, delta mileage (distance between instructions), notification of the official speed limits and a written description of each turn intended to make sure everyone stayed on-course and did not wander off and get lost, or stuck in many of the waterholes in the forest. Rudy & Nancy Samsel ran ‘ sweep’ just in case, but were never called to action and arranged for the breakfast spread. Dom Miliano , in addition to coordinating with the spons or and running ‘Car 1' in a Paul Miller Porsche Cayenne, ran the final route check three days before the event, to make sure Bob and I did not do anything silly along the route. Click here to read more of the Pine Barrens adventure! And, perhaps most important, it helps fellow Road Rallyists know about your event and plan their travels to attend! Jeanne English maintains this calendar, with input from Deena Rowland of the National Office as sanctions come in from Organizers. Seek out the latest calendar off the www.scca.com website! And while there — checkout the new RoadRally page layout for our programs downloads and information! “Let’s take a quick look at the 1968 statistics: there were 57 events in the series (16 Nationals, 41 Divisionals), compared with 48 in 1967; 542 members qualified (vs 390 in 1967); entries per event averaged 45 (vs 42 in 1967); a new record entry of 157 starters on the South Jersey Region’s March Lion Divisional broke the previous high of 148 set on the Kansas City Region’s Flaming Fall National; almost 2509 individuals completed; Class B provided 39% of the entries (vs 35% in 1967; and so on. RReNews: I had the honor of knowing Harry and he was of great help to me along the way when I started my service to SCCA. To read this January 1969 Rallyist Newsletter in full, click here. Thank you to Bruce Gezon for providing us with this great treasure on SCCA's Rallying past to go along with the 2017 Season Standings! 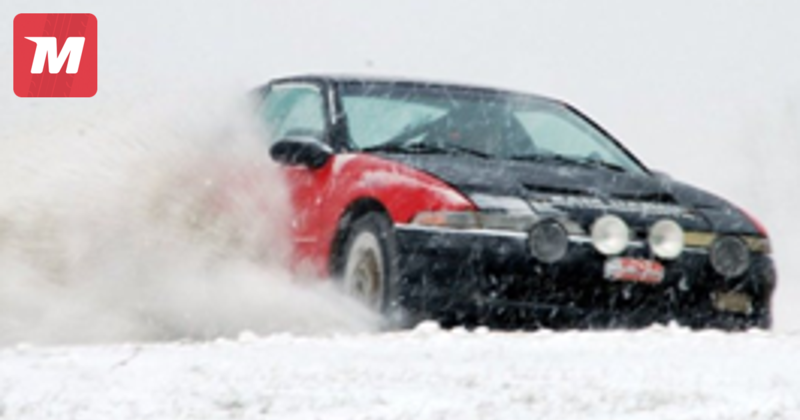 The RoadRally Competition Season is now a calendar year – January to December. As we close out the 2017 Season, here are the SCCA RoadRally National Championship Participation Numbers provided by Pointskeeper Bruce Gezon. Be sure you read A Look Back to the Rally Stats, and read Rally Director Harry Handley's Rallyist Newsletter from January 1969 for a comparison! In 2017, there were 138 different people participating in Course National/Divisional rallies, 250 in the GTA series and 279 in the Tour series. Making Tour and GTA near equal in popularity with Course rallies lagging around half of those numbers. Cal Club and Indianapolis Regions offered rallies in all three series. As promised, RReNews publishes the standings for the SCCA National Road Rally Championships from Bruce Gezon , Points Keeper. We look forward to working with him again in 2018 to get the Standings in a timely manner for your perusal. The official Excel spreadsheet for sending in your standings will be sent by Deena Rowland when a Sanction number is issued. Organizers may also find the spreadsheet to report National and Divisional RoadRally results in the Rules and Documents section of the www.scca.com/roadrally website! Gary provided these two years ago and with the recent changes to SCCA Classifications has just posted up the update for his wonderful resource. Thank you Mr Starr for your support to road rally in North America!